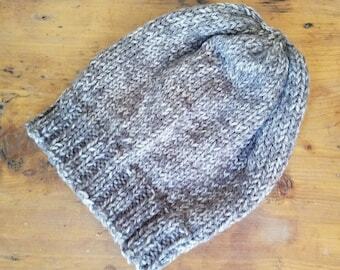 Hand knit hats, scarves, and gloves for women and men. 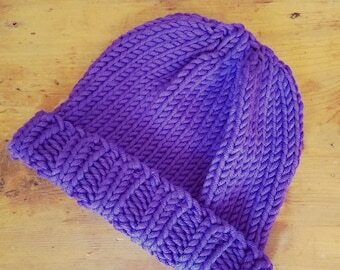 Slouch Hat, Tam, Beanie, Beret, Stocking Cap Purple Plumb Maroon Burgundy Blue Multicolored. 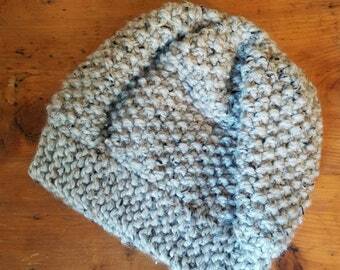 A stocking cap that's a slouch hat! 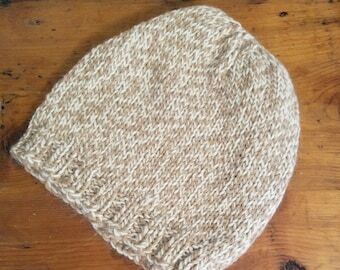 Slouch Hat, Tam, Beanie, Beret, Stocking Cap Tan, Taupe, Beige, Grey, Gray. 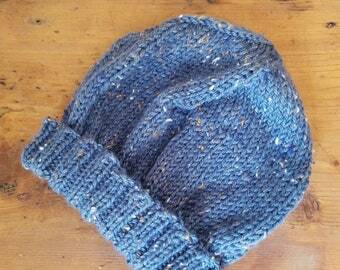 A stocking cap that's a slouch hat! Boot Cuffs, Boot Toppers, Ankle Warmers reversible grey gray charcoal hand knit. Close the gap at the top of your boots. Boot Cuffs, Boot Toppers, Ankle Warmers pink rose hand knit. Close the gap at the top of your boots. Cowl pink green yellow tan multicolored mobius scarf, endless scarf, continuous scarf, gaitor. Vivid colors only silk can show. Super soft. Love the way it looks! This is a lovely hand crafted item! I wear it as a necklace rather than use as a key ring. It is very beautiful and I'm happy to have found it. The artist who put this together has an eye for beauty! Scarf hand knit in blue, navy, grey, white and metallic yarn. A brilliantly colored nubby textured scarf. All Unwound's hand spun cotton yarn. 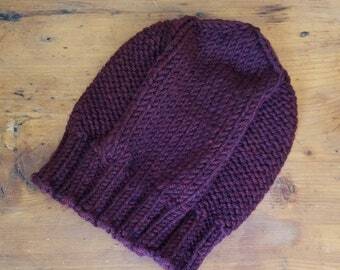 3 or 4 double pointed needles are used at one time to knit all of my gloves and most of my hats. 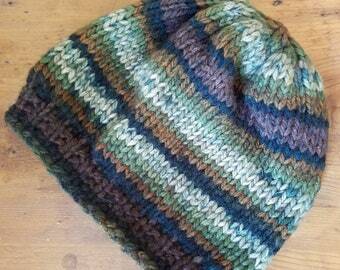 Multicolored Slouch Hat hand knit in a Merino blend. Merino is a soft luxurious fiber. Hats Continue to Sell like Hotcakes! Hats remain my primary focus. You can always find wool blends on AllUnwound that hold up to everyday life. I always stock a few acrylic hats, perfect for those allergic to wool or avoiding animal products. 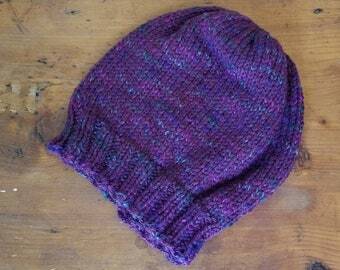 To keep things interesting some hats are knit with luxury yarns such as Alpaca and Merino. While I do spin my own yarn, most of the items I sell in my shop are made from commercial yarn. The variety of interesting commercially available yarns has expanded over the past few years. When I travel I search out yarns that aren't available in my home state, or online. Some items are truly "one of a kind" because that yarn was a one time purchase. So if you see something you like be sure to grab it. All Unwound continues to knit with a variety of types of yarns and colors. Scarves, gloves and other knit items are on my needles too. Offering something for every taste and style is All Unwound's goal. 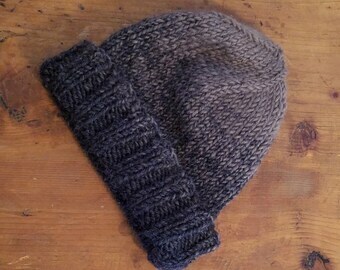 Most of my items are handmade so no two items will be exactly alike. They are made in a smoke free and pet free workshop. Colors do vary on computer monitors, so be sure to read the descriptions. If you have questions please ask. Please contact me with any problems or concerns that you have. I want you to be happy with my creations. Items may be returned for 14 days after purchase for any reason, as long as they are undamaged. Once I have received the item in it's original condition I will refund you the purchase price but not the shipping. I am located in Florida and must charge you Florida sales tax on items shipped to Florida. Shipping Address: I will ship to your PayPal address. Buyers are responsible for any and all duties and customs charges that may be incurred. These fees are charged by your country, not me.